I’m so excited to get back in the swing of things, and I thought I’d start off with sharing a glimpse into the Bewhiskered Studio. Of course, calling it a studio may be a bit of a stretch. I refer to it as my nook. And unlike a proper Southern lady I didn’t tidy up before taking the picture so you get to see it – and me – in all our disheveled glory. Yes I am wearing bunny slippers. I realized that I’ve never answered my own interview questions, so here ya go. Tell us a bit about yourself: Well, I was born in Macon, GA and raised in Alabama. I freeze instantly above the Mason Dixon line, but I enjoy a visit up North every now and again. I graduated with an English degree from The University of South Alabama, which I chose primarily due to its proximity to the beach and New Orleans. I worked in marketing after college, doing graphic design and promotions. After giving birth to my first son I became a stay at home Mom. Bewhiskered came along after that to fill my crafting void. My husband, another son and two cats round out our family. How did you come up with your shop name? I love animals and knew that whatever I’d be making, it would have some sort of animal connection. Thus the name Bewhiskered. When did you start sewing? I honestly don’t remember. My Mother taught me to sew forever ago and I’ve dabbled with it off and on ever since. What made you want to start selling your creations? 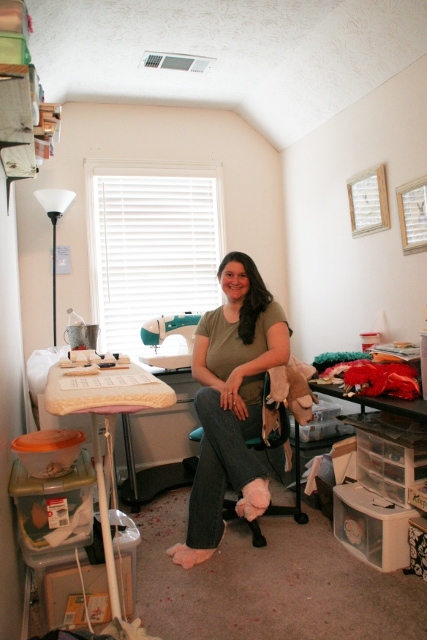 When I became a stay at home Mom, I needed some sort of outlet for my creativity and sewing seemed like a natural choice. I was already sewing cloth diapers for my son, and he’s the reason Ruggles were born. They were so cute, I couldn’t stop at making just one. After I’d exhausted all of my pregnant friends, I turned to Etsy to give me a place to spread the Ruggle love. Please describe your creative process? It starts with an animal. Sometimes I’ll see a new animal on Cute Overload or Zoo Borns and that becomes the inspiration for a Ruggle. Sometimes I sit down with a giant encyclopedia of the world’s creatures I have and flip through until I find something that catches my fancy. Other times the inspiration comes from clients who want something I’ve never done before. Then I just try and make the Ruggle resemble the actual animal as much as possible, while still keeping it cute. Is your shop involved in charity work? Yes! 10% of annual profits (or at least $25) from Bewhiskered is given to an animal charity. I also occasionally contribute to other causes, like April’s Army. Are your items custom or premade? Although I try to keep a lot of Ruggles in stock in my shop, I’d say a full 50% of my work is custom. Tell us two of your short term goals and one long term goal: One short term goal is to organize my studio space. I’d love to have everything neatly put away when it’s not in use! My long term goal is to have Bewhiskered be successful enough to fund my other hobbies: photography and horseback riding. Walk us through a typical day in your life: I wake up around 6am when my youngest son Erik wakes up. I spend about an hour entertaining him until my older son Jake wakes up. Kiss my husband as he leaves for work and fix breakfast for myself, Erik and Jake. Drop Jake off at Preschool at 9am. Once I’m back home I’ll check email and return any convos I’ve gotten overnight. Prep and ship any Ruggles that have sold and spend an hour or two interacting with my Etsy team members and writing blog and Tumblr posts/updating statuses on Facebook and Twitter. Sew for a while. Pick Jake up from school at 1pm. Play with Erik and Jake until it’s time for afternoon naps. When they wake up it’s time for a snack and we play until dinner time. My husband comes home from work around 6 and we eat dinner as a family. After dinner my husband plays with Jake while I check my email one last time and put Erik to bed. Then it’s getting Jake ready for bed, getting myself ready for bed, journaling, reading a book or magazine and sleep. What is your favorite item in your shop at the moment? The Lion Ruggle. He’s so soft! If you had any super power, what would it be? I would love to be a shapeshifter. Sometimes it would be very handy to be able to turn into an octopus, or a wolf. So there you have it. This is where the Ruggles are born. And as you can see from that pile of fur on the right, a lot of them are waiting to be sewn so I’m going to get on that. You sure have everything handy around you! It’s always great to know a little bit more about the crafter behind the amazing items in the shop! Yes, everything is very close. LOL I wish it were all neatly organized the way I’d like it to be. Someday I’ll find the time to do that!